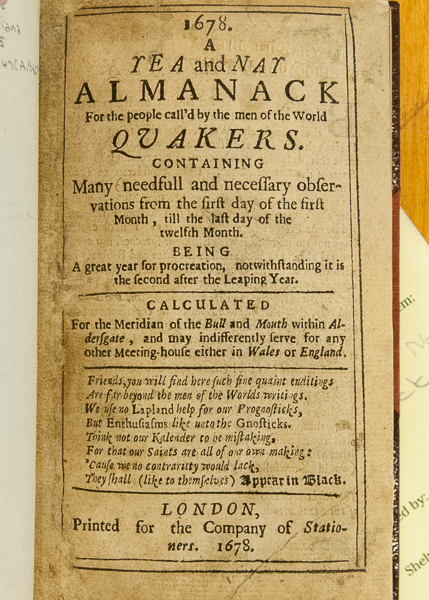 Haverford’s Quaker & Special Collections has three amusing 17th-century almanacs: A Yea and Nay Almanack for the People Call’d by the Men of the World Quakers for 1678, 1679, and 1680. 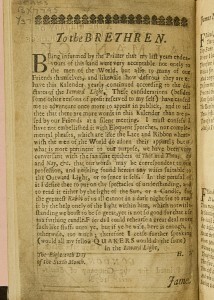 The three are bound together in one volume. 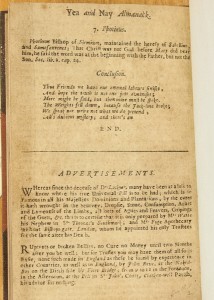 Title page for Winstanley’s 1678 Yea and Nay satirical Quaker almanac. These Yea and Nay were the genius of William Winstanley ( Dictionary of National Biography entry is behind a paywall), whose Poor Robin almanacs were wildly popular in Restoration England. 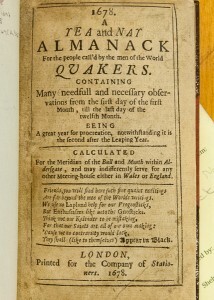 Winstanley complied various religious almanacs, including the anti-Catholic Protestant Almanack and the Episcopal Almanack . 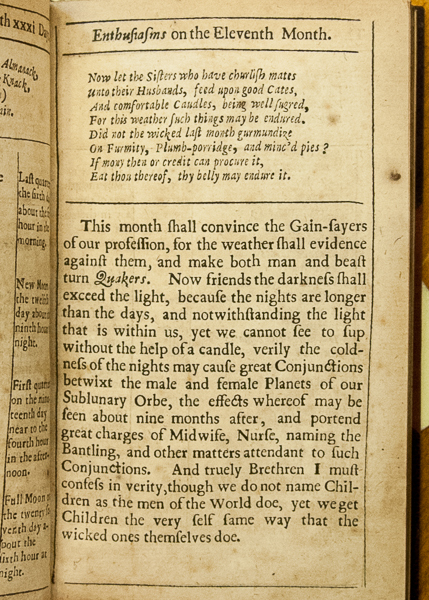 The Yea and Nay almanacs mocked Quaker beliefs, practices, and habits. 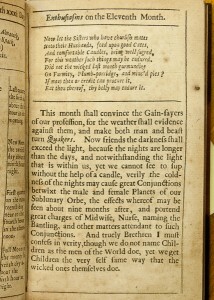 In his “To the Brethren” Winstanley mocks the Quakers, their inner light, their speech, and their dress. Winstanley collected a number of endorsements for his almanac, the first from James Nayler’s ghost—Nayler was an infamous Quaker who joined the army during the Civil War and then reenacted Christ’s entry into Jerusalem by riding a donkey into Bristol (this Dictionary of National Biography entry is also behind the same paywall; the Wikipedia entry is free but contains less material). Nayler was tried and convicted of blasphemy and, apparently, had his tongue pierced with a hot iron and was stigmatized. Now friends the darkness shall exceed the light, because the nights are longer than the days, and notwithstanding the light that is within us, yet we cannot see to sup without the help of a candle, verily the coldness of the nights may cause great Conjunctions betwixt the male and female Planets of our Sublunary Orbe, the effects whereof may be seen about nine months after, and portend great charges of Midwife, Nurse, name the Bantling, and other matters attendant to such Conjunctions. Winstanley’s safe prediction that in January the light will be shorter than the darkness because the days are shorter than the nights. Oh, and because of the cold “great Conjunctions” are likely to occur between men and women. 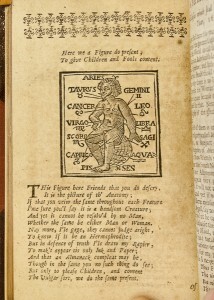 He also mocked the zodiacal man that was found in nearly every almanac. Typically, these figures illustrated the relationships between the parts of the body and the zodiacal signs that influenced those parts. Starting with Aries at the head and working down to the feet through the twelve signs of the zodiac. Winstanley includes the standard diagram but makes fun of it in the poem underneath. 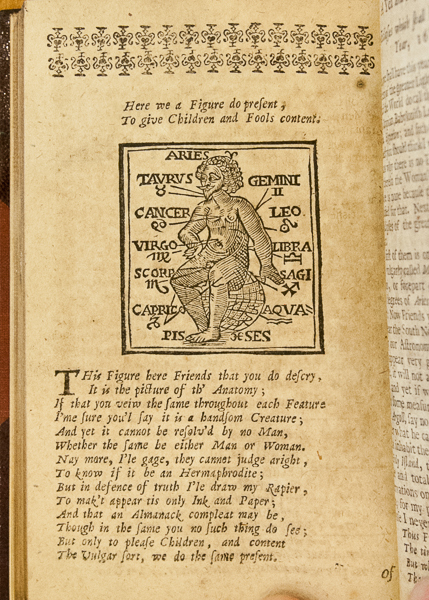 Is the zodiacal man a man, or a woman, or a hermaphrodite? Winstanley is uncertain. 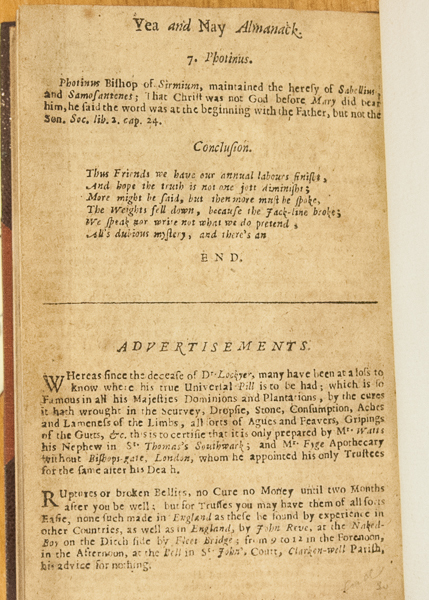 A final note: on the last page of one of these almanacs is an advertisement for Dr. Lockyer’s Universal Pill, that apparently cured “Scurvey, Dropsie, Stone, Consumption, Aches, and Lameness of the Limbs, all sorts of Agues and Feavers, Gripings of the Gut, &c.” The 1670s and 1680s witnessed a rapid development of a patent medicine market. See, for example, the scurvy epidemic or the Pilulae Antipudendagriae or the widespread marketing use of the pilulae. Advertisement for Dr. Lockyer’s Universal Pill, which could be purchased from Mr. Watts’ nephew in St. Thomas’s Southwark and Mr. Fyge, Apothecary outside Bishops-gate.